Keeping up with the trend...., kind of.! 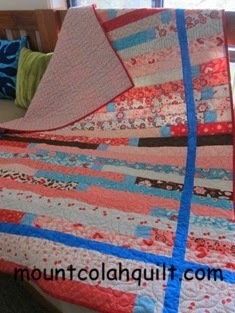 And, here is my version of jelly roll quilt with extra bits thrown in. It was fun to make. The binding actually took a lot longer to finish than the piecing for this quilt. 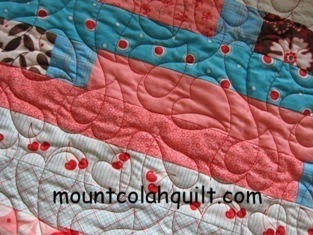 I chose the quilting pattern named 'meanderinghearts' by Willow Leaf Studio for the quilt. It stitched very well, and I think the quilted quilt looks lovely and delightful. 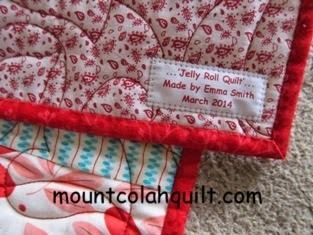 Love your jelly roll quilt and how are you? I've been a bit lax on looking at some blogs lately as we've moved house, but am doing some catch up. Take care. Thanks very much, Susan, for your kind words. :-) I'm keeping very busy at work, and am doing well with my quilting service - enjoying it very much. Hope all is well at your end with moving house, etc.